Cafe @ All Saints01432 370415work RestaurantCafé @ All Saints is a wonderful fresh food cafe set in the heart of Hereford. Cafe @ All Saints is set in the striking context of a medieval church building serving fresh, simple food that is extraordinarily good. Everything served on the daily changing menu is produced on site, even the bread, using the best local produce from a great network of Herefordshire producers. The menu changes everyday at Cafe @ All Saints, so keep popping in to see the day’s delights. Café @ All Saints is perfect for morning coffee, lunch or afternoon tea – take a break and have a drink in the wonderful atmosphere of All Saints. Or for a special evening event why not book the whole café for a private party? See our private parties page for more detail. No table reservations. Licenced. Daily changing lunch menu, sandwiches on home-made bread and superb coffee. 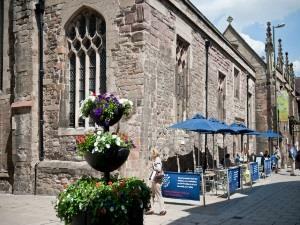 Café @ All Saints is a wonderful fresh food cafe set in the heart of Hereford. Cafe @ All Saints has flat access on ground floor and a disabled loo. In the city centre at the end of Broad Street and beginnning of Eign Gate pedestrianised area.